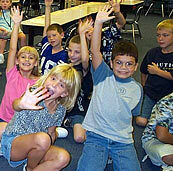 WeWrite Kids!™ books are created by groups of children, in a workshop setting. During the workshop, WeWrite captures the children's creative energies and wisdom through an illustrator, writer, and photographer. First, the children are introduced to the theme of the story about your industry, message, or a common experience the children share—through a tour or short presentation. Then they are given creative license to author their story, while an illustrator sketches. This professionally-illustrated and edited story is then published for private or national distribution—giving a fresh look to the topic. In addition to the children's story, the book can include information that conveys your message to secondary audiences. Ideal as a marketing tool, fundraiser or philanthropic giveaway, or to improve customer service—it's all seen through the eyes of children. Two two-hour workshop sessions produce one 64-page book. The entire process from workshop to publication can be completed within 120 days. A project coordinator is selected. A group of children is selected for the workshop. WeWrite brings the production team to the selected site and conducts the workshop. WeWrite provides editing, drafts, and a proof copy subject to approval. WeWrite launches the book in a bookstore or site of your choice—spotlighting both the children and sponsors—in an opportunity of a lifetime.